Jo was alone in the twilight, lying on the old sofa, looking at the fire, and thinking. It was her favorite way of spending the hour of dusk. No one disturbed her, and she used to lie there on Beth's little red pillow, planning stories, dreaming dreams, or thinking tender thoughts of the sister who never seemed far away. Her face looked tired, grave, and rather sad, for tomorrow was her birthday, and she was thinking how fast the years went by, how old she was getting, and how little she seemed to have accomplished. Almost twenty-five, and nothing to show for it. Jo was mistaken in that. There was a good deal to show, and by-and-by she saw, and was grateful for it. "An old maid, that's what I'm to be. A literary spinster, with a pen for a spouse, a family of stories for children, and twenty years hence a morsel of fame, perhaps, when, like poor Johnson, I'm old and can't enjoy it, solitary, and can't share it, independent, and don't need it. Well, I needn't be a sour saint nor a selfish sinner, and, I dare say, old maids are very comfortable when they get used to it, but..." And there Jo sighed, as if the prospect was not inviting. It seldom is, at first, and thirty seems the end of all things to five-and-twenty. But it's not as bad as it looks, and one can get on quite happily if one has something in one's self to fall back upon. At twenty-five, girls begin to talk about being old maids, but secretly resolve that they never will be. At thirty they say nothing about it, but quietly accept the fact, and if sensible, console themselves by remembering that they have twenty more useful, happy years, in which they may be learning to grow old gracefully. Don't laugh at the spinsters, dear girls, for often very tender, tragic romances are hidden away in the hearts that beat so quietly under the sober gowns, and many silent sacrifices of youth, health, ambition, love itself, make the faded faces beautiful in God's sight. Even the sad, sour sisters should be kindly dealt with, because they have missed the sweetest part of life, if for no other reason. And looking at them with compassion, not contempt, girls in their bloom should remember that they too may miss the blossom time. That rosy cheeks don't last forever, that silver threads will come in the bonnie brown hair, and that, by-and-by, kindness and respect will be as sweet as love and admiration now. Gentlemen, which means boys, be courteous to the old maids, no matter how poor and plain and prim, for the only chivalry worth having is that which is the readiest to pay deference to the old, protect the feeble, and serve womankind, regardless of rank, age, or color. Just recollect the good aunts who have not only lectured and fussed, but nursed and petted, too often without thanks, the scrapes they have helped you out of, the tips they have given you from their small store, the stitches the patient old fingers have set for you, the steps the willing old feet have taken, and gratefully pay the dear old ladies the little attentions that women love to receive as long as they live. The bright-eyed girls are quick to see such traits, and will like you all the better for them, and if death, almost the only power that can part mother and son, should rob you of yours, you will be sure to find a tender welcome and maternal cherishing from some Aunt Priscilla, who has kept the warmest corner of her lonely old heart for `the best nevvy in the world'. and lay staring up at him in startled silence, till he stooped and kissed her. Then she knew him, and flew up, crying joyfully . ..
"Oh my Teddy! Oh my Teddy!" "Dear Jo, you are glad to see me, then?" "Glad! My blessed boy, words can't express my gladness. Where's Amy?" "Your mother has got her down at Meg's. We stopped there by the way, and there was no getting my wife out of their clutches." "Your what?" cried Jo, for Laurie uttered those two words with an unconscious pride and satisfaction which betrayed him. "Oh, the dickens! Now I've done it." And he looked so guilty that Jo was down on him like a flash. "You've gone and got married!" "Yes, please, but I never will again." And he went down upon his knees, with a penitent clasping of hands, and a face full of mischief, mirth, and triumph. "Very much so, thank you." "Mercy on us. What dreadful thing will you do next?" And Jo fell into her seat with a gasp. "A characteristic, but not exactly complimentary, congratulation," returned Laurie, still in an abject attitude, but beaming with satisfaction. "What can you expect, when you take one's breath away, creeping in like a burglar, and letting cats out of bags like that? 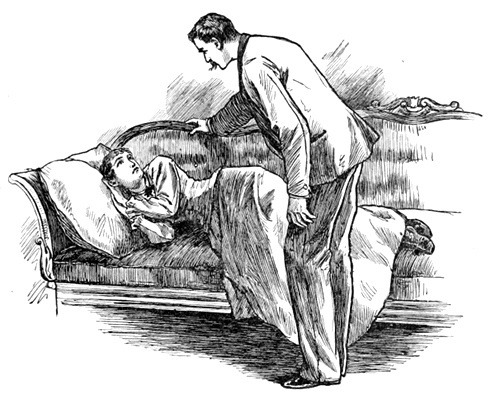 Get up, you ridiculous boy, and tell me all about it." "Not a word, unless you let me come in my old place, and promise not to barricade." Jo laughed at that as she had not done for many a long day, and patted the sofa invitingly, as she said in a cordial tone, "The old pillow is up garret, and we don't need it now. So, come and fess, Teddy." "How good it sounds to hear you say `Teddy'! No one ever calls me that but you." And Laurie sat down with an air of great content. "What does Amy call you?" "That's like her. Well, you look it." And Jo's eye plainly betrayed that she found her boy comelier than ever. "Don't I look like a married man and the head of a family?" "Not a bit, and you never will. You've grown bigger and bonnier, but you are the same scapegrace as ever." "Now really, Jo, you ought to treat me with more respect," began Laurie, who enjoyed it all immensely. "How can I, when the mere idea of you, married and settled, is so irresistibly funny that I can't keep sober!" answered Jo, smiling all over her face, so infectiously that they had another laugh, and then settled down for a good talk, quite in the pleasant old fashion. "It's no use your going out in the cold to get Amy, for they are all coming up presently. I couldn't wait. I wanted to be the one to tell you the grand surprise, and have `first skim' as we used to say when we squabbled about the cream." "Of course you did, and spoiled your story by beginning at the wrong end. Now, start right, and tell me how it all happened. I'm pining to know." "Fib number one. Amy did it to please you. Go on, and tell the truth, if you can, sir." "Now she's beginning to marm it. Isn't it jolly to hear her?" said Laurie to the fire, and the fire glowed and sparkled as if it quite agreed. "It's all the same, you know, she and I being one. We planned to come home with the Carrols, a month or more ago, but they suddenly changed their minds, and decided to pass another winter in Paris. But Grandpa wanted to come home. He went to please me, and I couldn't let him go along, neither could I leave Amy, and Mrs. Carrol had got English notions about chaperons and such nonsense, and wouldn't let Amy come with us. So I just settled the difficulty by saying, `Let's be married, and then we can do as we like'." "Of course you did. You always have things to suit you." "How did you ever get Aunt to agree?" "It was hard work, but between us, we talked her over, for we had heaps of good reasons on our side. There wasn't time to write and ask leave, but you all liked it, had consented to it by-and-by, and it was only `taking time by the fetlock', as my wife says." "Aren't we proud of those two word, and don't we like to say them?" interrupted Jo, addressing the fire in her turn, and watching with delight the happy light it seemed to kindle in the eyes that had been so tragically gloomy when she saw them last. "A trifle, perhaps, she's such a captivating little woman I can't help being proud of her. Well, then Uncle and Aunt were there to play propriety. We were so absorbed in one another we were of no mortal use apart, and that charming arrangement would make everything easy all round, so we did it." "When, where, how?" asked Jo, in a fever of feminine interest and curiosity, for she could not realize it a particle. "Six weeks ago, at the American consul's, in Paris, a very quiet wedding of course, for even in our happiness we didn't forget dear little Beth." "Why didn't you let us know afterward?" asked Jo, in a quieter tone, when they had sat quite still a minute. "We wanted to surprise you. We thought we were coming directly home, at first, but the dear old gentleman, as soon as we were married, found he couldn't be ready under a month, at least, and sent us off to spend our honeymoon wherever we liked. Amy had once called Valrosa a regular honeymoon home, so we went there, and were as happy as people are but once in their lives. My faith! Wasn't it love among the roses!" "Jo, dear, I want to say one thing, and then we'll put it by forever. As I told you in my letter when I wrote that Amy had been so kind to me, I never shall stop loving you, but the love is altered, and I have learned to see that it is better as it is. Amy and you changed places in my heart, that's all. I think it was meant to be so, and would have come about naturally, if I had waited, as you tried to make me, but I never could be patient, and so I got a heartache. I was a boy then, headstrong and violent, and it took a hard lesson to show me my mistake. For it was one, Jo, as you said, and I found it out, after making a fool of myself. Upon my word, I was so tumbled up in my mind, at one time, that I didn't know which I loved best, you or Amy, and tried to love you both alike. But I couldn't, and when I saw her in Switzerland, everything seemed to clear up all at once. You both got into your right places, and I felt sure that it was well off with the old love before it was on with the new, that I could honestly share my heart between sister Jo and wife Amy, and love them dearly. Will you believe it, and go back to the happy old times when we first knew one another?" "I'll believe it, with all my heart, but, Teddy, we never can be boy and girl again. The happy old times can't come back, and we mustn't expect it. We are man and woman now, with sober work to do, for playtime is over, and we must give up frolicking. I'm sure you feel this. I see the change in you, and you'll find it in me. I shall miss my boy, but I shall love the man as much, and admire him more, because he means to be what I hoped he would. We can't be little playmates any longer, but we will be brother and sister, to love and help one another all our lives, won't we, Laurie?" He did not say a word, but took the hand she offered him, and laid his face down on it for a minute, feeling that out of the grave of a boyish passion, there had risen a beautiful, strong friendship to bless them both. Presently Jo said cheerfully, for she didn't the coming home to be a sad one, "I can't make it true that you children are really married and going to set up housekeeping. Why, it seems only yesterday that I was buttoning Amy's pinafore, and pulling your hair when you teased. Mercy me, how time does fly!" "As one of the children is older than yourself, you needn't talk so like a grandma. I flatter myself I'm a `gentleman growed' as Peggotty said of David, and when you see Amy, you'll find her rather a precocious infant," said Laurie, looking amused at her maternal air. "You may be a little older in years, but I'm ever so much older in feeling, Teddy. Women always are, and this last year has been such a hard one that I feel forty." "Poor Jo! We left you to bear it alone, while we went pleasuring. You are older. Here's a line, and there's another. Unless you smile, your eyes look sad, and when I touched the cushion, just now, I found a tear on it. You've had a great deal to bear, and had to bear it all alone. What a selfish beast I've been!" And Laurie pulled his own hair, with a remorseful look. But Jo only turned over the traitorous pillow, and answered, in a tone which she tried to make more cheerful, "No, I had Father and Mother to help me, and the dear babies to comfort me, and the thought that you and Amy were safe and happy, to make the troubles here easier to bear. I am lonely, sometimes, but I dare say it's good for me, and..."
"You never shall be again," broke in Laurie, putting his arm about her, as if to fence out every human ill. "Amy and I can't get on without you, so you must come and teach `the children' to keep house, and go halves in everything, just as we used to do, and let us pet you, and all be blissfully happy and friendly together." "If I shouldn't be in the way, it would be very pleasant. I begin to feel quite young already, for somehow all my troubles seemed to fly away when you came. You always were a comfort, Teddy." And Jo leaned her head on his shoulder, just as she did years ago, when Beth lay ill and Laurie told her to hold on to him. "You are the same Jo still, dropping tears about one minute, and laughing the next. You look a little wicked now. What is it, Grandma?" "I was wondering how you and Amy get on together." "Yes, of course, but which rules?" "I don't mind telling you that she does now, at least I let her think so, it pleases her, you know. By-and-by we shall take turns, for marriage, they say, halves one's rights and doubles one's duties." "You'll go on as you begin, and Amy will rule you all the days of your life." "Well, she does it so imperceptibly that I don't think I shall mind much. She is the sort of woman who knows how to rule well. In fact, I rather like it, for she winds one round her finger as softly and prettily as a skein of silk, and makes you feel as if she was doing you a favor all the while." It was good to see Laurie square his shoulders, and smile with masculine scorn at that insinuation, as he replied, with his "high and mighty" air, "Amy is too well-bred for that, and I am not the sort of man to submit to it. My wife and I respect ourselves and one another too much ever to tyrannize or quarrel." Jo like that, and thought the new dignity very becoming, but the boy seemed changing very fast into the man, and regret mingled with her pleasure. "I am sure of that. Amy and you never did quarrel as we used to. She is the sun and I the wind, in the fable, and the sun managed the man best, you remember." "She can blow him up as well as shine on him," laughed Laurie. "such a lecture as I got at Nice! I give you my word it was a deal worse than any or your scoldings, a regular rouser. I'll tell you all about it sometime, she never will, because after telling me that she despised and was ashamed of me, she lost her heart to the despicable party and married the good-for-nothing." "What baseness! Well, if she abuses you, come to me, and I'll defend you." "I look as if I needed it, don't I?" said Laurie, getting up and striking an attitude which suddenly changed from the imposing to the rapturous, as Amy's voice was heard calling, "Where is she? Where's my dear old Jo?" In trooped the whole family, and everyone was hugged and kissed all over again, and after several vain attempts, the three wanderers were set down to be looked at and exulted over. Mr. Laurence, hale and hearty as ever, was quite as much improved as the others by his foreign tour, for the crustiness seemed to be nearly gone, and the old-fashioned courtliness had received a polish which made it kindlier than ever. It was good to see him beam at `my children', as he called the young pair. It was better still to see Amy pay him the daughterly duty and affection which completely won his old heart, and best of all, to watch Laurie revolve about the two, as if never tired of enjoying the pretty picture they made. The minute she put her eyes upon Amy, Meg became conscious that her own dress hadn't a Parisian air, that young Mrs. Mofffat would be entirely eclipsed by young Mrs. Laurence, and that `her ladyship' was altogether a most elegant and graceful woman. Jo thought, as she watched the pair, "How well they look together! I was right, and Laurie has found the beautiful, accomplished girl who will become his home better than clumsy old Jo, and be a pride, not a torment to him." Mrs. March and her husband smiled and nodded at each other with happy faces, for they saw that their youngest had done well, not only in worldly things, but the better wealth of love, confidence, and happiness. For Amy's face was full of the soft brightness which betokens a peaceful heart, her voice had a new tenderness in it, and the cool, prim carriage was changed to a gentle dignity, both womanly and winning. No little affectations marred it, and the cordial sweetness of her manner was more charming than the new beauty or the old grace, for it stamped her at once with the unmistakable sign of the true gentlewoman she had hoped to become. "Love has done much for our little girl," said her mother softly. "She has had a good example before her all her life, my dear," Mr. March whispered back, with a loving look at the worn face and gray head beside him. Daisy found it impossible to keep her eyes off her `pitty aunty', but attached herself like a lap dog to the wonderful chatelaine full of delightful charms. Demi paused to consider the new relationship before he compromised himself by the rash acceptance of a bribe, which took the tempting form of a family of wooden bears from Berne. A flank movement produced an unconditional surrender, however, for Laurie knew where to have him. "Young man, when I first had the honor of making your acquaintance you hit me in the face. Now I demand the satisfaction of a gentleman," and with that the tall uncle proceeded to toss and tousle the small nephew in a way that damaged his philosophical dignity as much as it delighted his boyish soul. "Blest if she ain't in silk from head to foot? Ain't it a relishin' sight to see her settin' there as fine as a fiddle, anch a happy procession as filed away into the little dining room! Mr. March proudly escorted Mrs. Laurence. Mrs. March as proudly leaned on the arm of `my son'. The old gentleman took Jo, with a whispered, "You must be my girl now," and a glance at the empty corner by the fire, that made Jo whisper back, "I'll try to fill her place, sir. The twins pranced behind, feeling that the millennium was at hand, for everyone was so busy with the newcomers that they were left to revel at their own sweet will, and you may be sure they made the most of the opportunity. Didn't they steal sips of tea, stuff gingerbread ad libitum, get a hot biscuit apiece, and as a crowning trespass, didn't they each whisk a captivating little tart into their tiny pockets, there to stick and crumble treacherously, teaching them that both human nature and a pastry are frail? Burdened with the guilty consciousness of the sequestered tarts, and fearing that Dodo's sharp eyes would pierce the thin disguise of cambric and merino which hid their booty, the little sinners attached themselves to `Dranpa', who hadn't his spectacles on. Amy, who was handed about like refreshments, returned to the parlor on Father Laurence's arm. The others paired off as before, and this arrangement left Jo companionless. She did not mind it at the minute, for she lingered to answer Hannah's eager inquiry. "Will Miss Amy ride in her coop (coupe), and use all them lovely silver dishes that's stored away over yander?" "Shouldn't wonder if she drove six white horses, ate off gold plate, and wore diamonds and point lace every day. Teddy thinks nothing too good for her," returned Jo with infinite satisfaction. "No more there is! Will you have hash or fishballs for breakfast?" asked Hannah, who wisely mingled poetry and prose. "I don't care." And Jo shut the door, feeling that food was an uncongenial topic just then. She stood a minute looking at the party vanishing above, and as Demi's short plaid legs toiled up the last stair, a sudden sense of lonliness came over her so strongly that she looked about her with dim eyes, as if to find something to lean upon, for even Teddy had deserted her. If she had known what birthday gift was coming every minute nearer and nearer, she would not have said to herself, "I'll weep a little weep when I go to bed. It won't do to be dismal now." Then she drew her hand over her eyes, for one of her boyish habits was never to know where her handkerchief was, and had just managed to call up a smile when there came a knock at the porch door. "Oh, Mr. Bhaer, I am so glad to see you!" cried Jo, with a clutch, as if she feared the night would swallow him up before she could get him in. "And I to see Miss Marsch, but no, you haf a party," and the Professor paused as the sound of voices and the tap of dancing feet came down to them. "No, we haven't, only the family. My sister and friends have just come home, and we are all very happy. Come in, and make one of us." "If I shall not be Monsieur de Trop, I will so gladly see them all. You haf been ill, my friend?" "Not ill, but tired and sorrowful. We have had trouble since I saw you last." "Ah, yes, I know. My heart was sore for you when I heard that," And he shook hands again, with such a sympathetic face that Jo felt as if no comfort could equal the look of the kind eyes, the grasp of the big, warm hand. "Father, Mother, this is my friend, Professor Bhaer," she said, with a face and tone of such irrepressible pride and pleasure that she might as well have blown a trumpet and opened the door with a flourish. If the stranger had any doubts about his reception, they were set at rest in a minute by the cordial welcome he received. Everyone greeted him kindly, for Jo's sake at first, but very soon they liked him for his own. They could not help it, for he carried the talisman that opens all hearts, and these simple people warmed to him at once, feeling even the more friendly because he was poor. For poverty enriches those who live above it, and is a sure passport to truly hospitable spirits. Mr. Bhaer sat looking about him with the air of a traveler who knocks at a strange door, and when it opens, finds himself at home. The children went to him like bees to a honeypot, and establishing themselves on each knee, proceeded to captivate him by rifling his pockets, pulling his beard, and investigating his watch, with juvenile audacity. The women telegraphed their approval to one another, and Mr. March, feeling that he had got a kindred spirit, opened his choicest stores for his guest's benefit, while silent John listened and enjoyed the talk, but said not a word, and Mr. Laurence found it impossible to go to sleep. If Jo had not been otherwise engaged, Laurie's behavior would have amused her, for a faint twinge, not of jealousy, but something like suspicion, caused that gentleman to stand aloof at first, and observe the newcomer with brotherly circumspection. But it did not last long. He got interested in spite of himself, and before he knew it, was drawn into the circle. For Mr. Bhaer talked well in this genial atmosphere, and did himself justice. He seldom spoke to Laurie, but he looked at him often, and a shadow would pass across his face, as if regretting his own lost youth, as he watched the young man in his prime. Then his eyes would turn to Jo so wistfully that she would have surely answered the mute inquiry if she had seen it. But Jo had her own eyes to take care of, and feeling that they could not be trusted, she prudently kept them on the little sock she was knitting, like a model maiden aunt. A stealthy glance now and then refreshed her like sips of fresh water after a dusty walk, for the sidelong peeps showed her several propitious omens. Mr. Bhaer's face had lost the absent-minded expression, and looked all alive with interest in the present moment, actually young and handsome, she thought, forgetting to compare him with Laurie, as she usually did strange men, to their great detriment. Then he seemed quite inspired, though the burial customs of the ancients, to which the conversation had strayed, might not be considered an exhilarating topic. Jo quite glowed with triumph when Teddy got quenched in an argument, and thought to herself, as she watched her father's absorbed face, "How he would enjoy having such a man as my Professor to talk with every day!" Lastly, Mr. Bhaer was dressed in a new suit of black, which made him look more like a gentleman than ever. His bushy hair had been cut and smoothly brushed, but didn't stay in order long, for in exciting moments, he rumpled it up in the droll way he used to do, and Jo liked it rampantly erect better than flat, because she thought it gave his fine forehead a Jove-like aspect. Poor Jo, how she did glorify that plain man, as she sat knitting away so quietly, yet letting nothing escape her, not even the fact that Mr. Bhaer actually had gold sleeve-buttons in his immaculate wristbands. "Dear old fellow! He couldn't have got himself up with more care if he'd been going a-wooing," said Jo to herself, and then a sudden thought born of the words made her blush so dreadfully that she had to drop her ball, and go down after it to hide her face. Nobody knew where the evening went to, for Hannah skillfully abstracted the babies at an early hour, nodding like two rosy poppies, and Mr. Laurence went home to rest. The others sat round the fire, talking away, utterly regardless of the lapse of time, till Meg, whose maternal was impressed with a firm conviction that Daisy had tumbled out of be, and Demi set his nightgown afire studying the structure of matches, made a move to go. "We must have our sing, in the good old way, for we are all together again once more," said Jo, feeling that a good shout would be a safe and pleasant vent for the jubilant emotions of her soul. They were not all there. But no one found the words thougtless or untrue, for Beth still seemed among them, a peaceful presence, invisible, but dearer than ever, since death could not break the household league that love made disoluble. The little chair stood in its old place. The tidy basket, with the bit of work she left unfinished when the needle grew `so heavy', was still on its accustomed shelf. The beloved instrument, seldom touched now had not been moved, and above it Beth's face, serene and smiling, as in the early days, looked down upon them, seeming to say, "Be happy. I am here." "Play something, Amy. Let them hear how much you have improved," said Laurie, with pardonable pride in his promising pupil. But Amy whispered, with full eyes, as she twirled the faded stool, "Not tonight, dear. I can't show off tonight." and Amy leaned against her husband, who stood behind her, feeling that her welcome home was not quite perfect without Beth's kiss. "You will sing with me? We go excellently well together." "My wife and I are very glad to meet you, sir. Please remember that there is always a welcome waiting for you over the way." "I too shall go, but I shall gladly come again, if you will gif me leave, dear madame, for a little business in the city will keep me here some days." He spoke to Mrs. March, but he looked at Jo, and the mother's voice gave as cordial an assent as did the daughter's eyes, for Mrs. March was not so blind to her children's interest as Mrs. Moffat supposed. "I suspect that is a wise man," remarked Mr. March, with placid satisfaction, from the hearthrug, after the last guest had gone. "I know he is a good one," added Mrs. March, with decided approval, as she wound up the clock. "I thought you'd like him," was all Jo said, as she slipped away to her bed.